The Siqens Ecoport power generator provides clean, silent and reliable energy anytime and anywhere; whether as a standalone solution or in combination with photovoltaic and wind as a complete renewable energy package. The unique combination of features makes the Ecoport fuel cell the perfect next generation power generator. Step by step, we support our customers with their specific off-grid applications and energy demands. 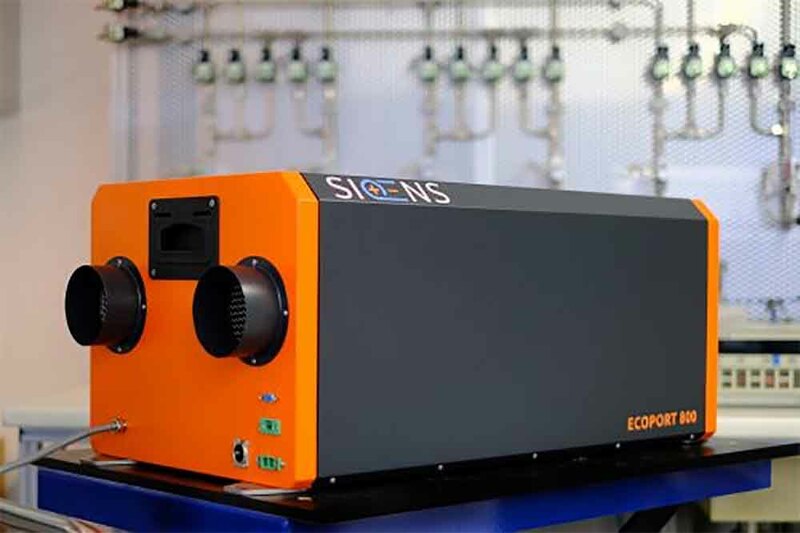 The Ecoport 800 as a standalone device as well as the EnergyBox as an integrated allround energy facility, offers numerous options for a customized energy solution. The stable energy performance is guaranteed at all times through an integrated, digital monitoring solution. Our modern world is highly dependent on the electricity grid. Take a few steps away from home and a stable power supply becomes a challenge. There is a huge demand for mobile power-on-demand solutions that are reliably, inexpensive and low in maintenance. Solar power allows you to enjoy the seclusion of nature without giving up modern comforts and conveniences. But, depending on the location, only about 80% of the annual energy demand can be covered by solar panels. The Ecoport, as an auxiliary power unit (APU), provides increased independence to electric as well as combustion engine vehicles. More than one billion people are without electricity supply. Many companies and villages do not want to wait for a nationwide power grid to be constructed – micro-grids are the trend. Remote monitoring provides you with up-to-date performance, system location or fuel tank fill level as well as many other key indicators. This is especially important in remote places or for managing many systems simultaneously at different operation sites. Customers can create automated messages and alerts, define reporting, optimize the performance and run extra analysis to optimize the system configuration. With our web-interface the customers can order fuel, accessories or additional services. Digital services are part of our integrated customer solution.